Over the past few years I have created a number of tutorial articles and videos on fire techniques relevant to the north woods or northern forest in winter. Here I’d like to pull together all of these threads into one coherent resource, along with some additional material and answers to FAQs. The main feature is the video above, which you should watch first. Even if you’ve seen this video before on my YouTube channel, this is actually a shiny new “remastered” version of the video. In this video I discuss and demonstrate fire lighting techniques that are simple, straightforward and reliable in cold conditions. key preparations and considerations you need to make for failsafe winter fire lighting. And for a bit of fun, watch right to the end for the deleted scenes…. In the rest of this post below, I go into more detail on some of the techniques as well as expanding on some others. I’ve drawn together lots of related material on this blog, which I hope you can see forms a coherent whole and, as such, I hope this serves you well in your winter fire-lighting endeavours. Spruces (Picea) and birch (Betula) are common and widespread northern hemisphere species, particularly in the northern temperate and boreal zones. They also have properties which make them useful for starting fires. Medium sized spruce trees typically have a mass of small, dead twigs near the base of their trunk. These are not only an ideal diameter for kindling, they contain resin and are usually dry due to the protection from dense green foliage above. Birch bark contains oils which not only make it flammable but also act as a waterproofing agent. Thus birch bark is an excellent ready-made natural fire-lighter. Further because the bark of birch has a laminate structure of fine, thin layers the bark can be scraped up with a sharp edge to create fine shavings and dust, which will readily ignite from a spark. Pines (Pinus) are another common and widespread genus, which if found dead, dry and standing can make excellent splints for fire lighting, partly because it splits relatively easily in sections between knots as well as it containing a good amount of oleoresin/turpentine. Straight-grained pine also makes an excellent basis for feathersticks. These are not covered in the above videos but they work well in such an environment and provide another reliable means of lighting fires, albeit requiring a sharp cutting tool and the requisite skill. 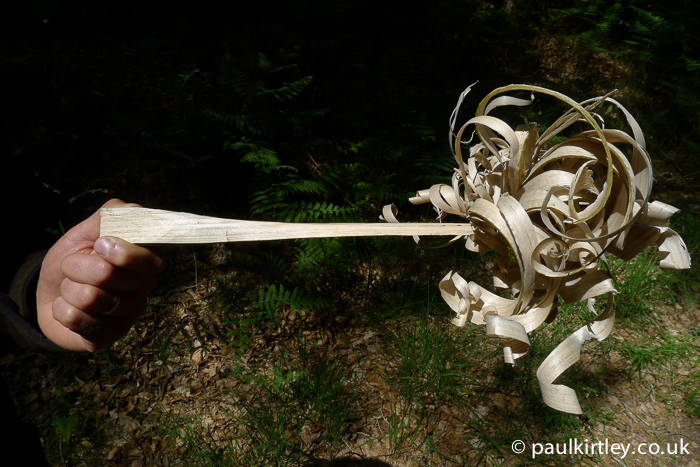 This is a featherstick made from straight-grained pine. Photo: Paul Kirtley. There are many species of wispy, beard-like lichens which festoon trees in the usnea, bryoria and alectoria genera. It is one of these that I use in the main feature video above. When dry, beard-like tree lichens such as this are very useful for fire-lighting. Photo: Paul Kirtley. As good students of bushcraft know, there are a number of excellent tinder fungi. Horses hoof fungus, Fomes fomentarius is one of the best. It grows in the northern woods on birch. 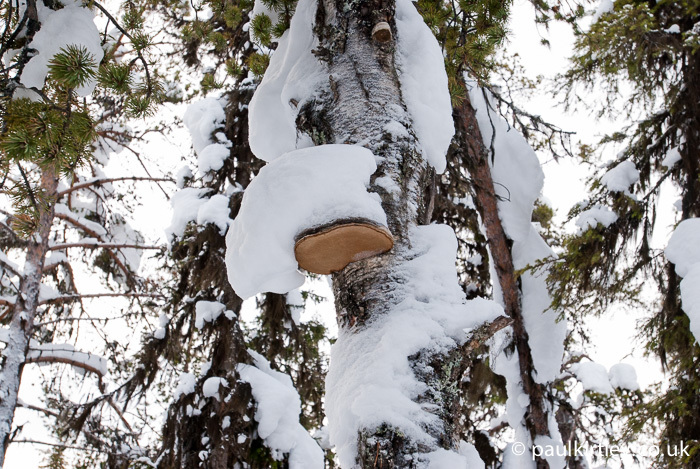 Fomes fomentarius is a tinder fungus found growing in birch in the boreal forest. Photo: Paul Kirtley. The traditional method of preparing Fomes for firelighting with flint and steel or even flint and iron pyrites is a little involved. It is much easier with a modern Firesteel (ferro rod). Over the last decade or so, the Swedish FireSteel, or ferro rod, has gone from being an obscure novelty to a ubiquitous fire-lighting gadget on sale in every camping store. If you don’t already own one, you can buy one here. Even so, most people’s technique can be refined by learning how to generate really big sparks with them. The typical action most people make is to generate a diffuse shower of sparks. This will work with many materials. For example, the lichens mentioned above, when teased out like cotton wool, accept a shower of sparks quite readily. Other potential forms of initial fuel, however, need a more concentrated heat source. If you can create a large, concentrated spark with your FireSteel, then you have more options available to you (e.g. the trama layer of some bracket fungi such as Fomes fomentarius mentioned above). The following video goes into detail on the required technique for generating large, concentrated sparks. It’s the method I use in the top video above too but the following video shows the specifics of the technique much more clearly. I’ve had the above videos in various places, including YouTube as well as here on this blog, before bringing them all together on this one page. Some of the common questions I receive are below with answers. Can you tell me more about your winter clothing? What knife are you using in your videos? What axe do you take winter camping? You mention digging down to the ground – what type of snow shovel do you use? How long does it take before a new Firesteel starts producing some proper sparks? When the FireSteel is new it is coated with a protective lacquer, which helps prevent it oxidising while in storage. With a couple of scrapes, you can remove this from the area of the steel you want to strike the spark (it will go from dull to shiny). Using the FireSteel technique from your video I can shave off material but no spark…why? If you are removing metal from the FireSteel but not attaining sparks, then the issue is not pressure but speed. Increase the speed of your scrape while maintaining the pressure. There is a point at which this will create a spark. Too slow and it won’t, however much you dig in. It’s actually the finger underneath which is much more likely to be cut if you mess up this technique.﻿ Make sure the pressure is largely parallel to the FireSteel, not too much downwards towards your finger. Also make sure you keep the knife under good control towards the end of the FireSteel. Well you’ll wear down the end more quickly than the rest but it does not waste the rest because once the end is worn down you just move back and do the same further up the steel. The rod effectively becomes shorter but you still use all the material, just in a different order to scraping down the full length on each strike. Doesn’t using your knife to spark the ferro rod damage the finely honed edge? And doesn’t the temperature of the sparks damage the temper of your blade? I am using the back of the knife, not the finely honed edge of the knife, so there will be no damage to the edge. Second, the spark is not changing the temper of the knife. You need to think about not just temperature but also the amount of energy involved. While the temperature is high (up to 3,000 degrees Celsius), the amount of heat energy is very, very small. Third, the spark is not sparking onto the blade but largely onto the material beneath it. Hi Paul, Happy new year. I have a new smock coming soon, which will be a bit more protective so it should be interesting in a similar situation. Not more kit? Maybe your treating yourself for the 17th eh. I hope you have a great day M,H,R. Adrian 42 yesterday. Yes it was a big paper round. Adrian, alas my old Norrona smock (seen in the top video above) is now 12 years old and somewhat threadbare in places. I’m also a bit stockier than I was back then. A new shell is required…. Many Happy Returns to you too. Just had a thought, how does leather hold up in arctic conditions. Do you have any tips for caring for leather in the arctic. Is it the same as for temperate zones? Paul – Not really got stuck into everything that you are offering on your site just yet – but I am hooked, it seems to have been a busy last few days for some reason – but what I have already seen has inspired and also impressed me – I am an ex light infantry soldier – having lived in a Basher for nearly 22 years of my life, so I like to think that I do know my stuff, but I am still finding find your blogs informative, interesting and an excellent revision session. Currently reviewing all my kit from PSK & EDC to Belt Order and 24 hr BOB up to a full 72 hr Burgan. I’m very glad you are getting so much out of my site. It’s always good to review kit, systems and protocols. Let me know if you have any particular new insights into organising your kit. Thanks you’re very kind. I’m glad you really enjoyed the first video. It is a special kind of forest there, particularly beautiful when the snow is like that. Paul, thanks for the informative video on fire starting in your neck of the woods. We don’t usually get that much snow here in Kentucky but sometimes. I appreciate your blog, information articles and videos. Keep up the excellent work and Happy New Year 2015. Oh by the way the deleted scenes were great. Hey Steve, nice to hear from you and Happy New Year to you too. I hope 2015 is a good one for you. Great videos and articles Paul, seen most before, nice to see them all in the same place. Will be very helpful for my upcoming trip to Swedish lapland. Mandatory viewing, as your vids always show the best methods and philosophy behind them. Many Thanks. Hope you’re having a prosperous New Year. Yes, it’s good to consolidate things sometimes. Thanks for your positive feedback. I’m glad this material is of practical relevance to you. 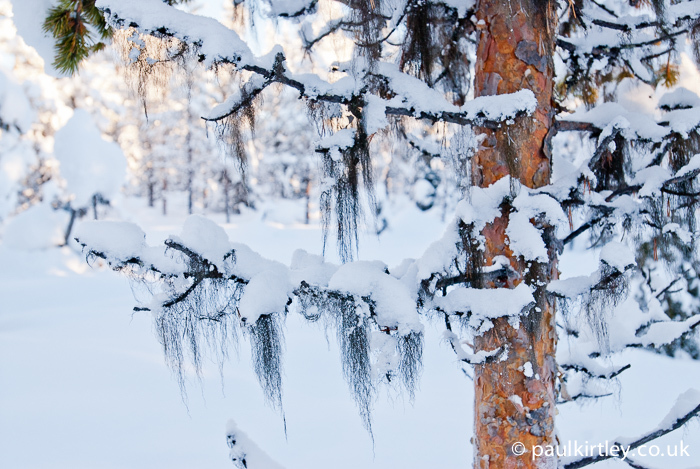 Whereabouts in Lapland are you headed? What will you be up to? Actually Im the only brit attending. The rest are dutch and Swedish. Really looking forward to it. Cheers. Thanks for your comment. I’m glad you enjoy my material. You are quite correct regarding the potential – and common – dampness of beard lichens. In the winter I always try to pick lichens which have had a bit of breeze blowing through them and are as free as possible of snow and ice. But they will often still have some inherent moisture. My method is to put some into my trouser pocket, not too tightly packed, so that the warmth from my body will drive off the moisture. I find this works quite well. I did mention it in the video (at the 7:25 mark) but, in retropsect, perhaps I could have emphasised the potential dampness more for those who are completely unfamiliar with this as a fire making material. Anyway, I won’t belabour the subject further. I enjoy your postings. I won’t labour it either. I agree. Birch bark is far superior. felling even moderate sized trees. I am up in the north of Sweden now and this video is the goods, pure and simple. Thank you very much for it.